This Thai yellow fried rice is colorful, easy to make, and tastes amazing. Made with fresh or frozen shrimp, this fried rice recipe also features greens, such as spring onion, fresh coriander, and peas. 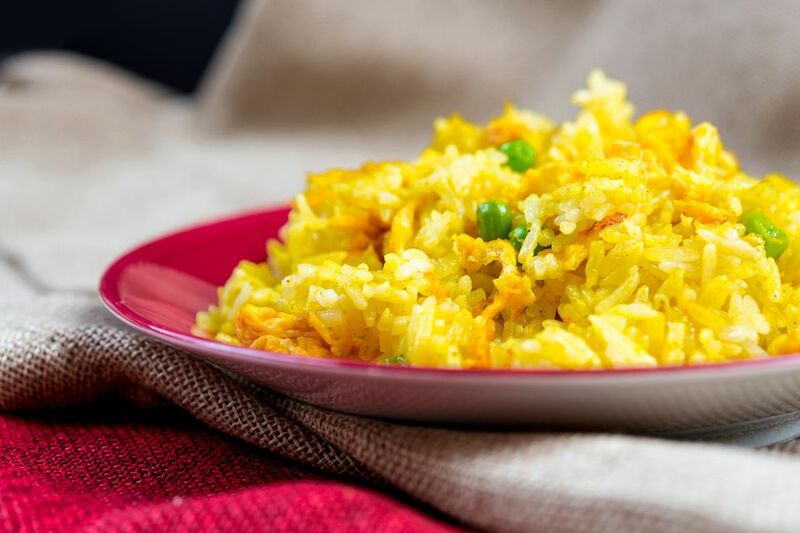 Turmeric is the special ingredient that makes the fried rice yellow, and because of its incredible health benefits, the addition of this spice makes this recipe a good-for-you treat. A great way to use up leftover rice—rice that is several days old is perfect for this simple but extremely tasty recipe. You can make this recipe with either white or saffron rice. Start with cold, cooked rice. If your rice has been freshly made, leave it in the refrigerator for several hours with the lid off to dry it out. Fried Rice Cooking Tip: At first, your cooked rice will be lumpy and sticking together. To separate it (this makes for a much better fried rice), place the rice in a large bowl. Add 1 tablespoon oil. Now use your fingers to mix the oil into the rice and separate the clumps. Continue working your fingers through until the rice is more or less separated into grains. Set aside. Mix the stir-fry sauce ingredients together in a cup. Omit the turmeric if using saffron rice. Set aside. Place a wok or large frying pan over medium-high heat. When the pan is hot, add 2 tablespoons oil plus the garlic and shrimp. Stir-fry 1-2 minutes, or until shrimp is pink and plump. Add a few teaspoons wine/cooking wine whenever the wok becomes dry. Push shrimp and garlic to the side of your wok or frying pan. Add a little more oil into the center of the wok, then break the eggs into this space. Quickly fry the eggs (as if you were making scrambled eggs), about 1 minute. Note: If you find egg coats the bottom of your wok or frying pan, you can also scramble the eggs in a separate pan and then add them. Keep the wok or frying pan hot for these last few steps (medium-high heat). Add the rice and peas, then pour the sauce over the top, distributing it as evenly as possible over the rice. Quickly begin "tossing" the rice in the wok/pan, using a shoveling-like motion (lifting from the bottom of the pan). A flat-bottomed spatula or plastic "egg flipper" works well for this. Continue "stir-frying" in this way for about 3 minutes, or until rice and peas are hot. Tip: When rice is done, you will hear it starting to "pop" in the wok. Taste-test the rice for salt (we find it is rarely salty enough). If needed, add a little more fish sauce (instead of salt), 1/2 tablespoon at a time, and continue stir-frying until desired taste is achieved. Remove from heat. Sprinkle the spring onion and coriander over the top. Serve hot straight from the wok/pan. For more formal occasions: Line the outside of a serving platter with cucumber slices. Scoop rice onto the platter, then sprinkle with the spring onion and coriander. For those who like it extra spicy, serve with a bottle of Thai chili sauce on the side.